Thanks for checking out my blog! Make sure to check out Fantabulous Cricut for the rest of the Spotlight Sunday projects!! Happy Friday!! It's a very happy Friday for me!! For one, it's my birthday :) and two.. I'm in DISNEYLAND!! Whoo hoo!! So it's design team day over at Pink Cricut and I decided to make a post it note holder for you all!! This is an acrylic 4x6 picture frame that I bought for $1 from Walmart. I laid it down and turned it into a post it note holder!! The stamp reads "Cinderella is proof that a New Pair of Shoes can change your life" and of course I choose to use this stamp because I'm in Disneyland! :) The black shoe and diamonds on the lighter pink paper are also from Designer Shoes stamp of the month stamp set. I used my silver glitter pen and added glitter to the shoe. Make sure to check out the other projects over at Pink Cricut!! LOVE Pink by Design stamps! For this project I used two PBD stamps. The first stamp I used says "Don't worry, it's just another gray Hare". I love that saying!! That stamp is from the Hoppy Easter stamp set. The second stamp that I used is actually a background stamp. The green cardstock was stamped in light blue memento ink with PBD Crazy Daisy background stamp. and I LOVE IT!! The FABULOUS Tricia from Tricia Nae Designs designed it for me. She's the GREATEST to work with! Thanks so much Tricia!! Rachel Miller!! Congrats Rachel! Please send your address to me at candacepelfrey@yahoo.com so I can mail out your stamps! EASTER!! 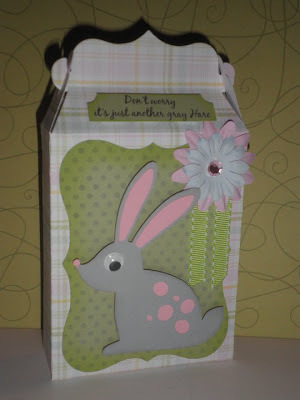 I just bought these easter stamps from Pink by Design "Hoppy Easter" and had to play with them!! I've been stalking Walmart and Target all weekend for Easter candy and finally found some chocolate easter eggs yesterday! Here is a couple of things I've come up with..
First project is of course.. Skittle Sticks :) The green background is cut from Gypsy Wanderings. 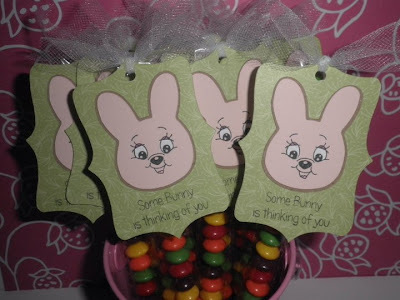 The bunnies are cut from Doodlecharms. I used blackout and shadow and then stamped the face with Peachy Keen - Bright Eyed and Bushy Tailed stamps. 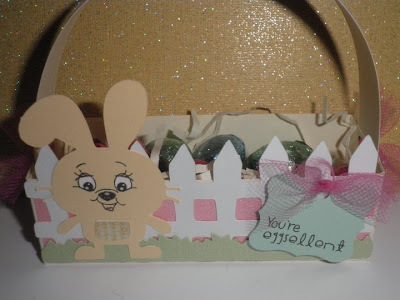 Second project is alittle easter type basket that I made using my Martha Stewart score board. I then decorated by adding a white picket fence and grass cut from Paper Doll Dress Up. The Bunny is from create a critter and of course had to use the same peachy keen face on this guy to match the skittle sticks :) There are 10 hershey chocolate eggs inside the basket but alot more can fit in there with a peep or chocolate bunny.. Pink by Design - Stamp of the Month (Jan + Feb) DT Projects! Yay! It's finally Design Team day over at Pink Cricut for Stamp of the Month! :) I am very excited to share these two projects with you!! And here is my project for February's stamp of the month- Designer Shoes. I cut this box from Spring Holiday Cards. I love this cartridge!! I mainly bought it for these boxes, they are perfect to put little gifts or gift cards in! I tiled the shoe stamp for the background and then cut out the leopard shoes from Paisley. The tag was cut from Gypsy Wanderings and the stamp "No matter what you've had for lunch, Shoes always fit" is also from that same stamp set. I love this sentiment!! Thank you so much for checking out my projects used Pink Cricut's stamp of the month sets! Make sure to check out the other Stamp of the Month designer Raven! Welcome to the Share the Love - Fantabulous Cricut Crawl- our version of a blog hop! If you have arrived from Brenda's blog then your in the right spot. If you would like to start at the begining of the crawl click here. The challenge for this crawl was to incorporate the word "Love". It could either be stamped or cut out on the cricut. I decided to make a "Love" Banner. The font and banner is cut from Birthday Bash. The hearts that the letters are in and the heart swirls on the ends are cut from Sweethearts cartridge. I strung the banner up using my Crinkle Ribbon which I got from My Craft Spot. I also used the new Pink by Design background stamps! I used Crazy Daisy. I stamped it in light pink on the light pink so it looks like a watermark almost.. Here is a close up of the banner.. you can see the dots from the background stamp. The black is a glittery black cardstock that I purchased from Joanns. Your next stop on the "Share the Love" Fantabulous Cricut Crawl is Cathy! Thanks for visiting my blog on this blog hop! Make sure to come back on Saturday because I will be in a Vintage Valentine hop! Welcome to the Lots of Love Blog Hop! If you have come from Liz's blog WhichCraft then you are in the right place! If you would like to start at the beginning of the Blog Hop please click here to be taken to Lovebug Creations. me obsessed with The Greeting Farm stamps! So of course I had to make a card using one! This is Cheeky Rockabilly. I colored her with Copics and then cut her out and used pop dots on her. The stamp "Be My Valentine" is from Pink by Design's stamp set "Love Always". The white ribbon at the bottom is called Crinkle Ribbon. I got it from My Craft Spot. Your next stop on the blog hop is my friend Erin at SpantastiKreations! Here is the complete line up.. Thanks!! Make sure to come back for another blog hop on Monday! !